Speak the name Alvin Slaughter and visions of dynamic worship songs and lively praise tunes rush to mind. Nominated for both the Dove and Stellar Awards, Alvin has been a pivotal part of the growth of praise and worship in the Church for decades. 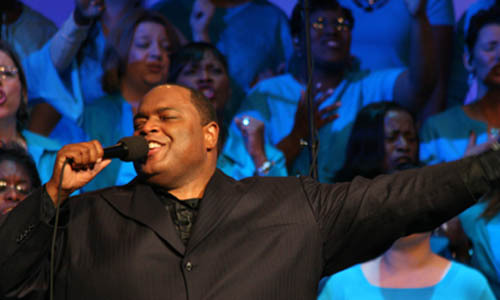 The former lead male vocalist of the multiple GRAMMY Award winning Brooklyn Tabernacle Choir is known for his cross-cultural songs and a smooth blending of gospel and contemporary Christian music, creating a style that’s uniquely his own. But don’t be fooled: there’s much more to this amazing artist than catchy songs and crystal clear vocals. Alvin is a man on a mission, and that mission is to help transform the lives of people who have been bound by self doubt and religious tradition, setting them free with the acceptance of God’s love and the power of a personal relationship with God. Alvin is the epitome of the phrase “success is a journey, not a destination.” He spent years living life as a defeated Christian. The effects of bankruptcy, foreclosure, welfare, low self esteem and a troubled marriage ruled his life until 1990 when he found himself on a collision course with the power of God. As the Word says, even in our weakness, God is strong. Alvin was set on a path that would lead him back through the doors of the church and right into the arms of Christ and the powerful, worlwide music ministry he had been called to. In 1991, Alvin began receiving invitations to sing at national evangelistic crusades and major Christian conferences. Today, as a recording artist, entrepreneur, inspirational speaker and philanthropist, he is a regular on Christian television and travels worldwide in concert ministry, healing hearts through his compassionate speaking and restoring joy with his songs of faith, exhorting Christians to live passionately for God. With the ability to capture the attention of every age, creed and ethnicity, Alvin Slaughter is a slam dunk for any ministry setting!